CHICAGO–The School of the Art Institute of Chicago (SAIC), a global leader in art and design education, announced that renowned artist and SAIC alum Jeff Koons will donate an artwork to the school, which will be sold to establish the Jeff Koons Scholarship Fund. 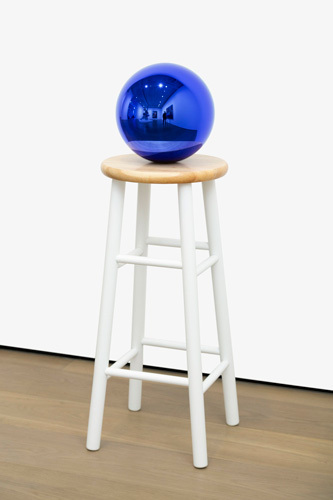 The sculpture, titled Gazing Ball (Stool), 2013–2016, is made of polychromed stainless steel, wood, glass, and aluminum. The Gazing Ball series, which Koons began in 2013, references the classical, historical, and the everyday. Each work includes a reflective hand-blown blue glass gazing ball that is commonly used as a suburban lawn ornament. The artwork, valued at $1 million, will be sold at a later date. The proceeds from the sale will provide need-based and merit-based scholarships, to be known as Jeff Koons Scholarships, to undergraduate students. Koons’s gift will contribute to the more than $46 million raised to date as part of Beautiful/Work: The Campaign for SAIC. Coming off of a yearlong celebration of its 150th anniversary, the school launched the public phase of its $50 million fundraising campaign just one year ago. More than 1,700 individual donors have made contributions, and alumni have donated a record $10.5 million. Koons came to SAIC to study under Chicago imagists and SAIC alumni Ed Paschke and Jim Nutt, an experience he’s described as being transformative to his development as an artist. In 2008, SAIC awarded Koons an honorary doctorate for his influential and thought-provoking career and work, some of which is on display in the Art Institute of Chicago.